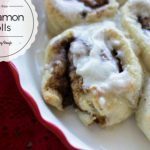 These Grain Free Everything Cinnamon Rolls are pure comfort food! 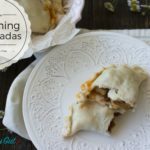 They bring back all your classic flavors: cinnamon, sugar and a warm dough wrapped in a sweet silky glaze. 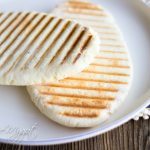 Finally, delicious rolls without the backlash effects of gluten, grains and dairy. 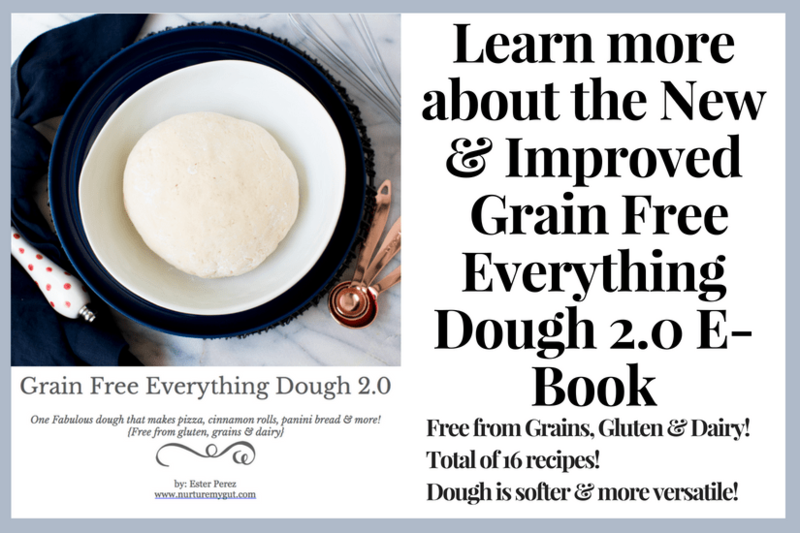 The first thing you want to do is make a batch of Grain Free Everything Dough. Cover your dough with a towel while you make your cinnamon sugar mixture. Next, lay some parchment paper on your surface and dust with tapioca flour. 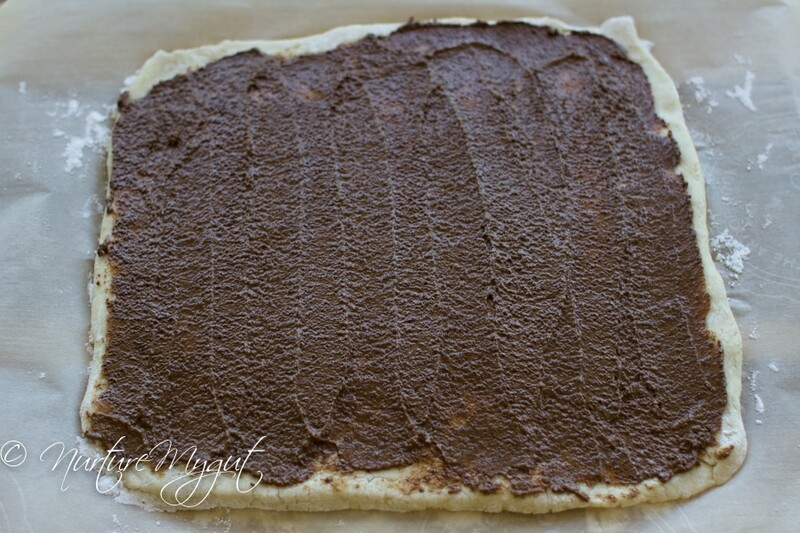 Roll out your dough into a large 10 by 12 inch rectangle. 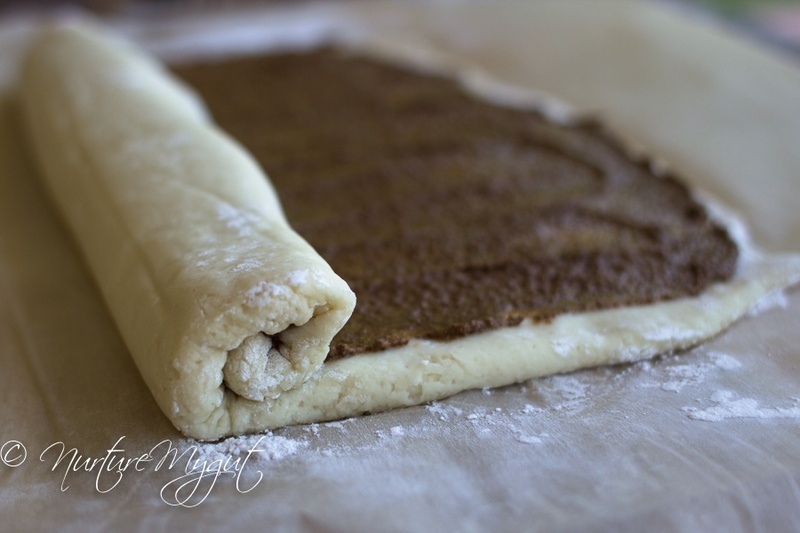 Spread your cinnamon sugar mixture over your dough and roll into a log. 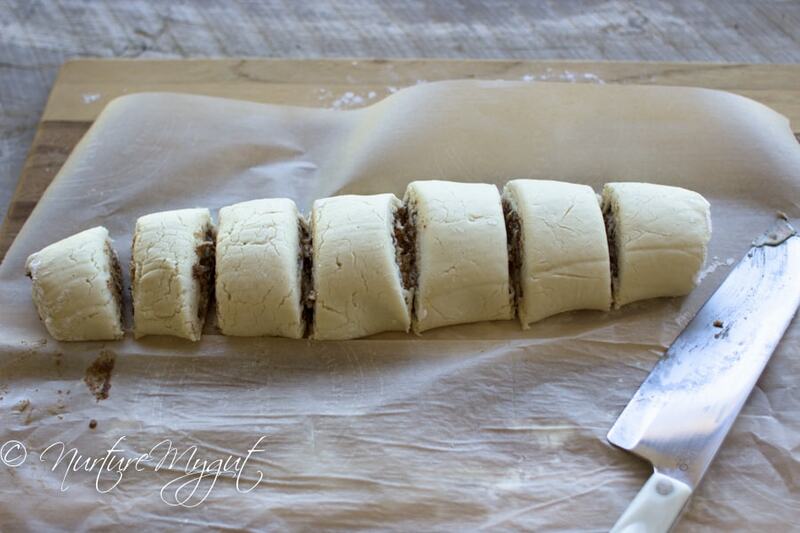 Use your parchment paper to roll dough over itself as in the photo above. Once it is into a log, slice into 7-8 rolls. Do not cut too thick or the center will be raw. I have tested this recipe at least 8 times and this is the only quirk, don’t cut too thick, trust me! Grease your baking tray with shortening and lay your cinnamon rolls cut side up. Bake in a 375 degree oven for 20 minutes or until edges are golden brown. While the cinnamon rolls are baking, make your glaze. I tested several different glaze recipes and my favorite is an Orange Coconut Cream glaze made with coconut cream, maple syrup and orange zest. If you want a classic icing, like my husband/kids prefer, then use Organic Powdered Confectioners Sugar which is made with sugar and tapioca starch. I have included two dairy free/grain free icing recipes below with a few links to popular icings for those of you that do not have any dairy allergies and want a classic cream cheese icing. 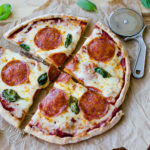 Let me know in the comments below how you liked this recipe! 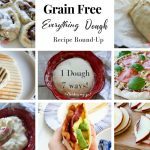 Grain Free Everything Cinnamon Rolls made with Grain Free Everything Dough. 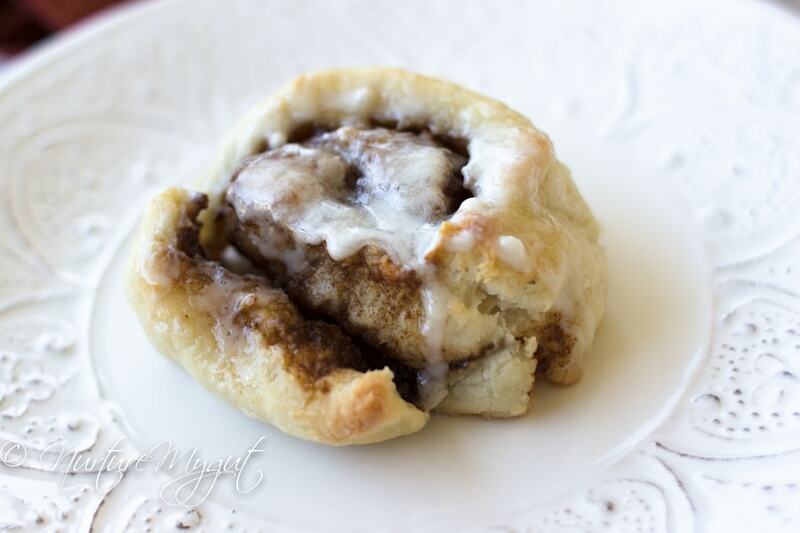 These delicious cinnamon rolls are the ultimate comfort food! 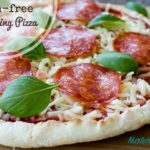 Completely grain free, gluten free and dairy free. 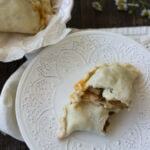 Stuffed with cinnamon, coconut sugar and maple syrup for a healthier version. In a small bowl, mix together shortening, coconut sugar, cinnamon, maple syrup and vanilla. Set aside. 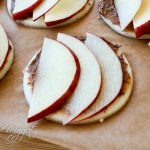 Place a sheet of parchment paper on counter or large cutting board. Dust surface and rolling pin with tapioca flour. Roll dough into a 10 by 12 inch rectangle. 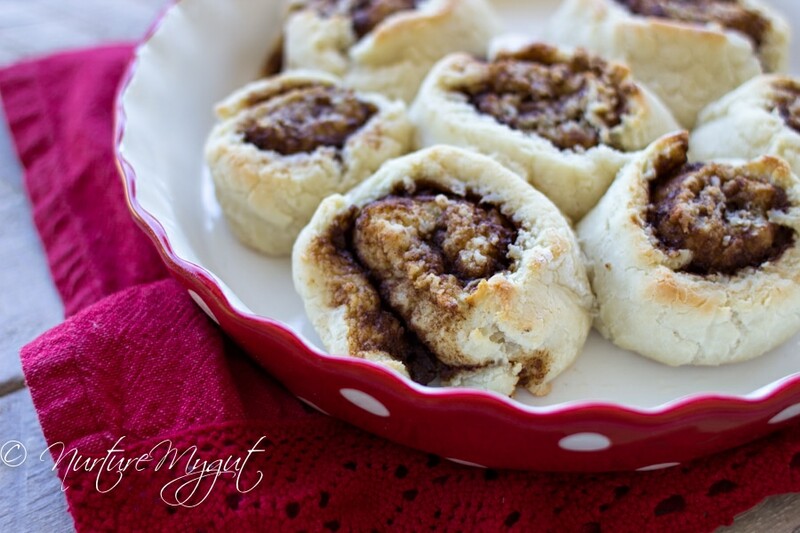 Spread cinnamon sugar mixture onto dough with a spatula. Slice into 7-8 pieces. Do not cut too thick so center cooks properly. 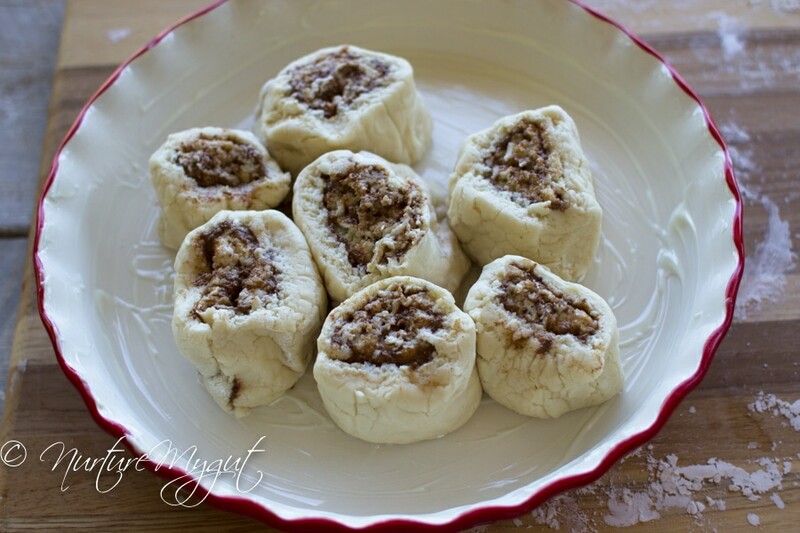 Grease a baking dish with shortening, place cinnamon rolls, cut side up and bake uncovered for 20 minutes. Top with desired glaze (see recipe choices below). Serve warm. Nutritional info below includes 1 tablespoon orange cream glaze per roll. In a small bowl, mix together coconut cream, maple syrup and orange zest. 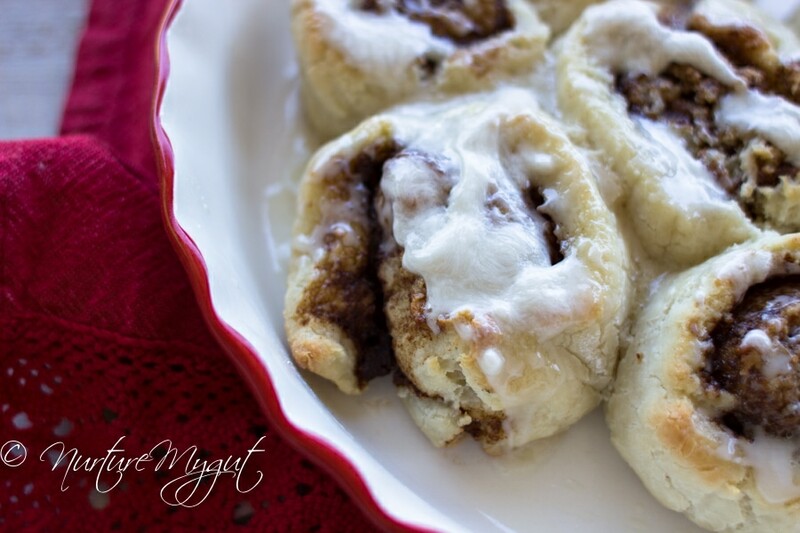 Top cinnamon rolls with orange coconut cream glaze and serve warm. In a mixing bowl, whisk together confectioners sugar, melted shortening and coconut milk until smooth and creamy. Add enough coconut milk until you reach desired consistency. Some like this thick, some like it thin. It’s personal preference. Why do these not rise? Is it supposed to be a quick rise yeast??? Thanks! Would this freeze reasonably well raw, or at least survive and overnight rise a la Alton Brown’s overnight cinnamon rolls? I’m trying to not have to wake up two hours early on Thanksgiving morning to put these together. I think it is best to make it fresh. 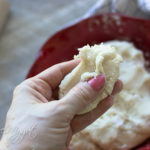 The dough is finicky when it is cold or chilled, you have to knead it and add hot water so I don’t know if it would survive if you try and bake it while its frozen or chilled. With all the work it takes to make the dough and cinnamon rolls, I think its best to try and make it fresh. Maybe next time you make it, freeze one cinnamon roll and bake it to test. I didn’t even get that far because my dough fermented in the fridge over the day-and-a-half it was in there and I had to toss it. It smelled awful. But I’m not giving up, I will just mix my dry ingredients ahead of time and try to make it as easy as possible to make them fresh! Had serious trouble rolling the dough out, it was soft like playdoh but once I tried to roll it out it crumbled. This is a pizza dough texture so it should roll easily. My guess is in the measuring. When measuring flour, it is best to scoop the flour from the bag into a mixing cup with a tablespoon and level off with the flat side of a butter knife. This prevents the flour from becoming compact and getting different measurements. If there was too much almond flour, then the dough will not hold properly. Also, did you use the xanthan gum? It is essential in this recipe. Another problem could have been letting the dough sit out too long. You want to use this dough while it is warm.